Confidence is discovered beyond your comfort zones. Confidence is a by-product of that inner power that propels us to keep taking action, bypassing our fears and self-doubts. You don’t have confidence when you start the race, but as you run and tap into your inner resources, it builds and takes you to the finish line. A common mistake I see is that people want to feel confident before they start anything, whether it’s a job, a new relationship, living in a new place, making new friends, and so on. It doesn’t happen like that. You have got to step out, risking your pride for the reward of finding your confidence. Embarking on a new venture — starting college, a new busi­ness a relationship, a job, or a passion project, or letting go of something that’s not working for you-probably fills you with trepidation, doubts, insecurities, and fear of failure, instead of excitement. We question ourselves and fill ourselves with neg­ative input that paralyzes us, making ourselves feel like we’ve failed before we’ve even begun. Shakespeare said it best, “Our doubts are traitors, and make us lose the good we oft might win, by fearing to attempt.” When I first started working on a new project and didn’t get the results I wanted, my confidence would automatically be diminished and shaken. My critical voice had to be reined in, like a wild horse that was trying to keep me from attempting anything new. The way to self-start is to cheer your­ self on, conspire in your favor. That power propels you forward, undermining the doubt and the insecurities, the fears of failure and the unknown. Look at all of these opportunities as chances to grow. Con­tinue to learn more about your abilities, your limitations, your resilience. You don’t know what you’re made of until you take the plunge. Life tested me by giving me experiences that didn’t match my expectations. But I also learned that I always had a choice. I could either collapse and give up on myself, or pick my­self up by the bootstraps and take action, blast through my fears and find my confidence on the other side. This hit home for me when I was cast as the housekeeper in Surviving Picasso, filmed in the famous Pinewood studios in Lon­don, and directed by the genius James Ivory. I’ll never forget going on set, all made up and in costume, rehearsing my scene with Anthony Hopkins, who was playing Picasso. I was weak in the knees and could hardly breathe! It took a lot of guts to keep thinking, “You go girl, you can do this.” I had to support myself, 100 percent, and in that moment what happened was amazing. Anthony Hopkins was so supportive, sensing that this was a big moment for me. He chatted with me in a lighthearted way to help me loosen up. We had such a good time doing the scene together, and at the end of shooting, he said to me, “Remember, Agapi, always be bold and mighty forces will come your way.” I’ve never forgotten that. Confidence is discovered beyond your comfort zones. When you break through the fear of failure and realize that it’s part of the process, you’ll discover that you can conquer almost anything if you keep going. Always be bold and mighty forces will come your way. 1. Affirm that you are not alone. You have got to “have your back” 100 percent. Get back to connecting with your inner power. There are three ways to know you’re not alone: you can reach within and grab hold of your core; you reach outward and ask for help; and you reach out to others and offer help. 2. Move into radical self-acceptance. Start appreciating every little thing about you, reinforcing the positive, and refrain from focusing on the negative. Write down a list of all your positive attributes. Make it as long as you can. 3. Don’t wait to be perfect before you take action. You are always going to be a work in progress. Don’t wait for perfect circum­stances. The moment to start taking action is now. It’s never too late. The willingness to do gives you the ability to do. Map out the next thing you would like to do and take steps toward it, no matter how microscopic. Remember that most of the people who have been successful have had many failures along the way. Failure is a step toward success. 4. Your presence is required. Keep your heart present as you live your daily life. Make it present in your conversations, all your interactions, and everything you do. Excerpted from WAKE UP TO THE JOY OF YOU: 52 MEDITATIONS AND PRACTICES FOR A CALMER, HAPPIER LIFE Copyright © 2016 by Agapi Stassinopoulos. Published by Harmony Books, an imprint of Penguin Random House LLC. AGAPI STASSINOPOULOS is a best-selling author and speaker who inspires audiences around the world. In her previous book, Unbinding the Heart: A Dose of Greek Wisdom, Generosity, and Unconditional Love, she shares the wisdom from her life’s adventures and experiences. 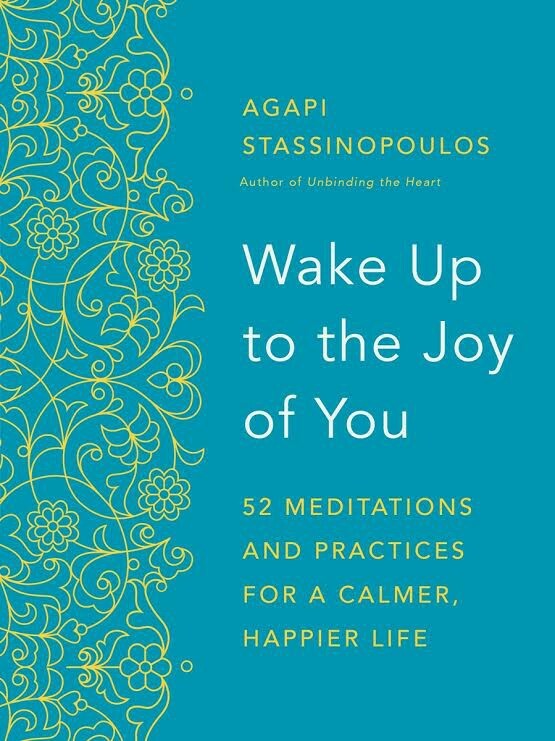 In her new book, Wake Up to the Joy of You: 52 Meditations and Practices for a Calmer, Happier Life, she takes readers on a journey and inspires them to let go of what doesn’t work and instead create the lives they really want. Agapi was trained in London at the Royal Academy of Dramatic Art and then moved on to receive her master’s degree in psychology from the University of Santa Monica. Her previous books on the Greek archetypes, Gods and Goddesses in Love and Conversations with the Goddesses, were turned into PBS specials. She is currently conducting workshops for Thrive Global, a company founded by her sister, Arianna Huffington, to help change the way we work and live. She divides her time between New York and Los Angeles and was born and raised in Athens, Greece. Silence Your Inner Critic. The Secret To Lifelong Confidence.